Vintage Large Art Deco Big Link Bolt Ring Clasp Bracelet 7.5 Able to be worn alone or used for large older vintage charms. It is light color goldtone or brass with large strong links that are etched with a 1930s-40s linear pattern on the edges. It also has a big antique bolt ring clasp. Size is 7.5" long by 7/8" wide across the links. In excellent, gently used condition. No dents or dings. No gold wear. No damage or repair. This is a lovely bracelet for your collection or adding vintage charms. 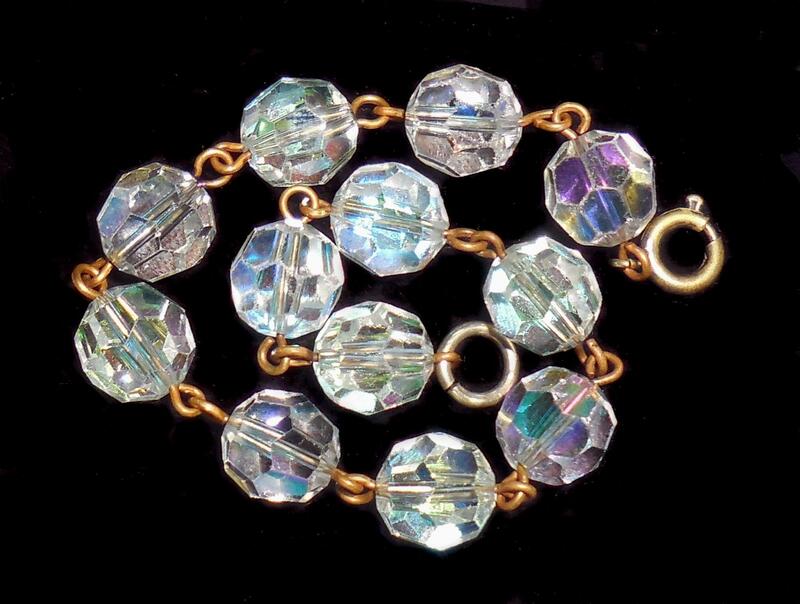 More pastel colorful than the photos this is a late Art Deco faceted crystals bracelet in excellent condition. Some stones have very minor rough edges but no cracks or chips to the stones. They are 8mm each and sparkle all colors of the spectrum. All are clear and clean. All are strung with quality gold metal connectors rather than string. Size is 7" long by just over 1/4" wide across. This is a lovely vintage bracelet for your collection. 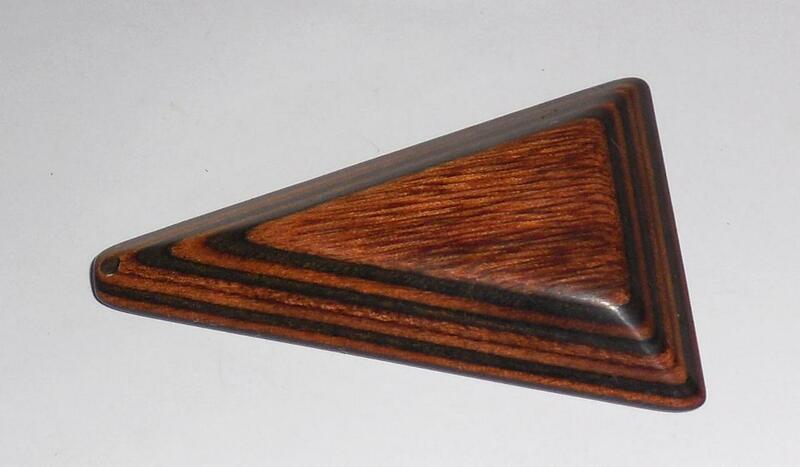 Geometric 2 Dimensional Large 1950s Vintage Plastic Wood Triangle Pendant Same as the old bakelite lamp pull pendant but in a colored transitional plastic wood. Rather than being of later colored plastic this is plastic with applied color. 2 3/4" by 1 13/16" Other than a scratch on the back (which could be covered with wax or scratch cover or polish) it is in excellent condition. It has a 3mm drill open to accommodate any bale and chain you like. Lovely pair of vintage 1960s marbled light to medium green color bakelite with yellow marbling. A little lighter color than photo. They have strong gold plated clip on backs. Simichrome tested. Old vintage stock from an old jewelry store that closed around 15 years ago. There is no wear and they are in excellent condition. The clips are strong and you can hear the loud snap when you close them. Size of each disc is 28mm or 1 1/8" across in diameter. 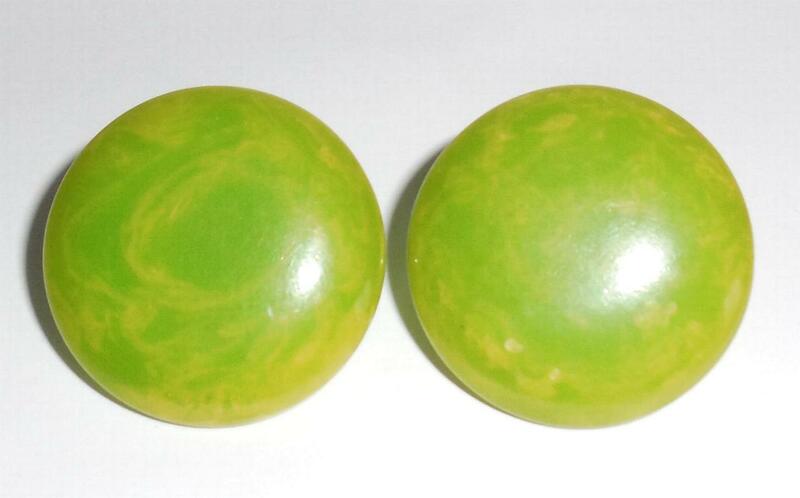 They are a lovely light kiwi lime green color with yellow marbling for your collection. 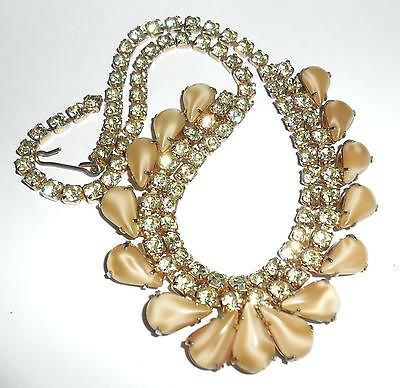 This is a beautiful vintage bib necklace with bright lemon lime (pale canary yellow with green flashing) crisp clean rhinestones and molded/poured glass fancy pear shaped stones. Size is 15 3/4" by 13/16" across the centerpiece. All of the stones are still bright and CLEAR. In excellent condition and having showy colorful rhinestones this is a lovely vintage statement necklace for your collection. Vintage Leverback Screwback Huggie Earrings Industrialist Screw Back Lever Back - YELLOW GOLD PLATED - This is a small, medium pair of never used, mint condition, unsigned Goldette, vintage 1970s to 1980s, hinged leverback screw back earrings with mid century modernist industrialist design. As many Goldette collectors know the gold plating on Goldette jewelry was so heavily applied that oftentimes the marking is either very faint or not found because it lies underneath the gold. These earrings were part of an estate of an old jeweler who manufactured and distributed jewelry for Goldette, Florenza, Hollycraft and many other costume houses during the 1970s to 1990s. They were never used and are in wonderful, original, mint condition. No gold wear. They are also showy and very well made. Screws work well. 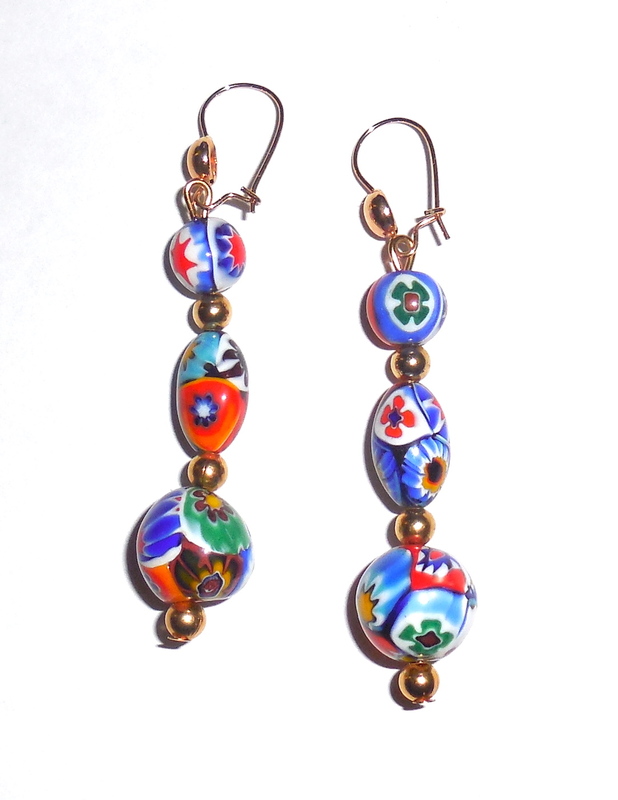 Size of each earrings is 3/4″ tall north to south by 1/2″ wide across the centers east to west. Weight is 9.4 grams for both. This is a gorgeous, showy pair of earrings for your vintage jewelry collection. Hard to find these old pieces in this condition! 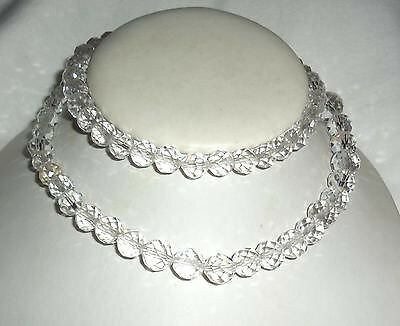 This is a very long 29" vintage Art Deco clear crystal necklace with its original fancy gold filled filigree clasp. The crystal is clear like rock crystal with only a hint of colors. It was restrung years ago on plastic which is strong and still holding strong. The beads are beautiful and range from 5mm to 15mm with the majority being around 10mm. Condition is excellent, gently used. This is a stunning showy necklace for your antique and vintage jewelry collection. From an estate and original. Vintage Lucite Cabs Fancy Antique Gold Bracelet Best Condition. 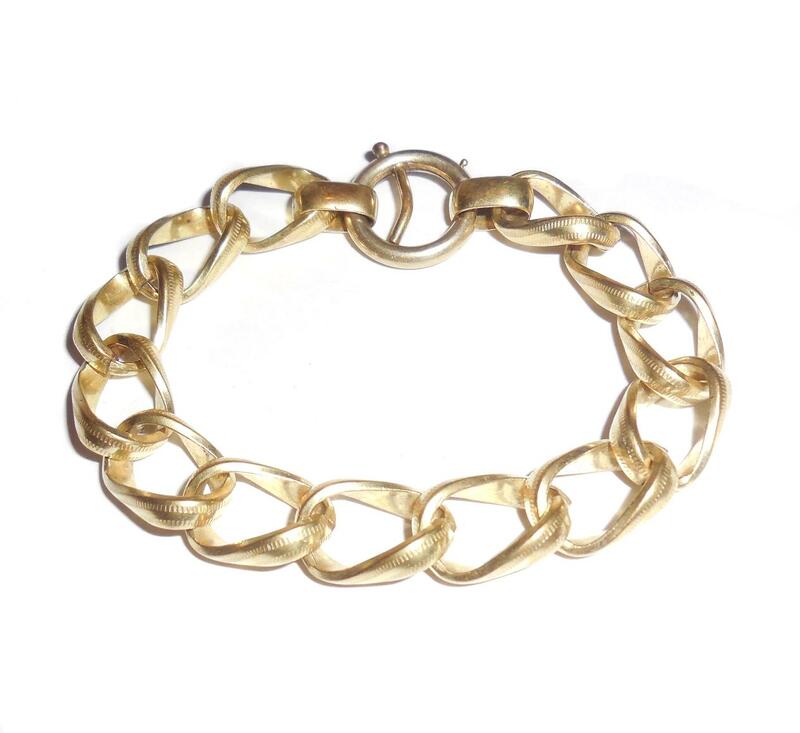 This is an impressive, heavy, chunky, vintage 1960s bracelet with lucite cab stones and an antiqued gold plated finish. Beautiful, no wear condition. No wear to the gold finish or the stones. The cabs are bright colors with a strong glow resembling the same colors as gemstones. All are clear and clean. The gold is very ornate with fancy, deeply recessed carving throughout. Size is 7 1/4" long by 5/8" wide across. Locking clasp is secure. 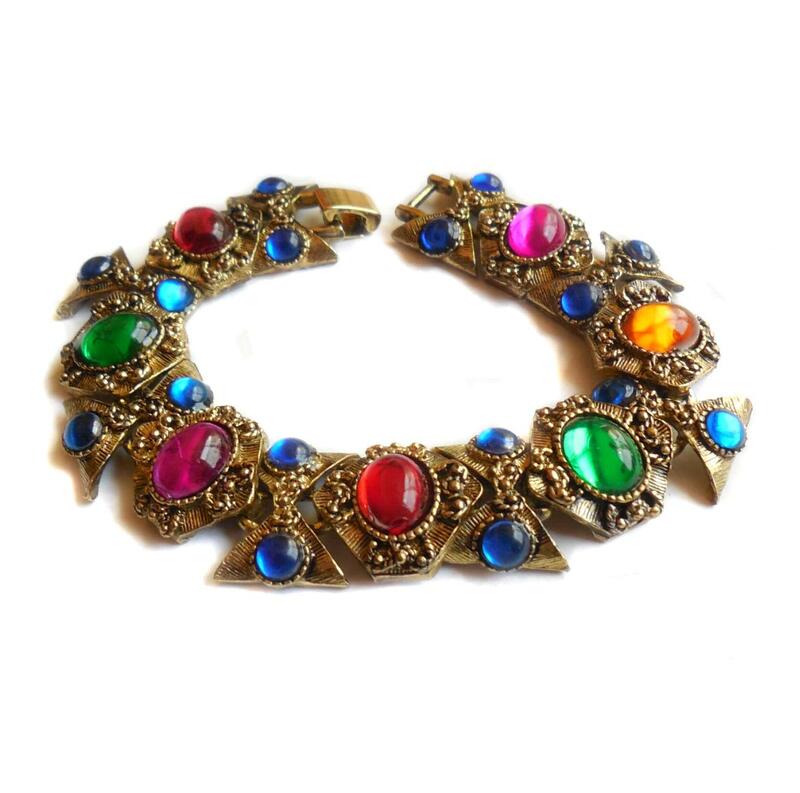 This is a gorgeous showy vintage statement bracelet for your collection!! Old store stock and in great condition. 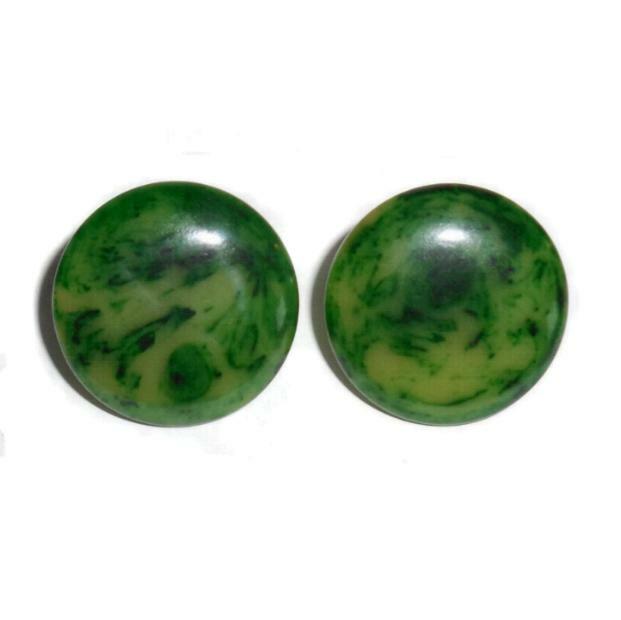 This is a pair of vintage simichrome tested and Guaranteed to be old strongly marbled bakelite clip on earrings in forest and jade green colors. They are large disc button shape and have small curvature so they sit pretty flat to the ear. Size is 28mm or 1 1/8" across. Large and noticeable. They have gold plated clip on backs that are strong and secure. No wear to the gold plating at all. These were only ever used for display. You can still hear the loud snap when clip are opened and then closed in place. No wear to the polished finish either. In great condition this is a lovely pair of vintage showy bakelite clip earrings for your collection or display. Old store stock and in great condition. 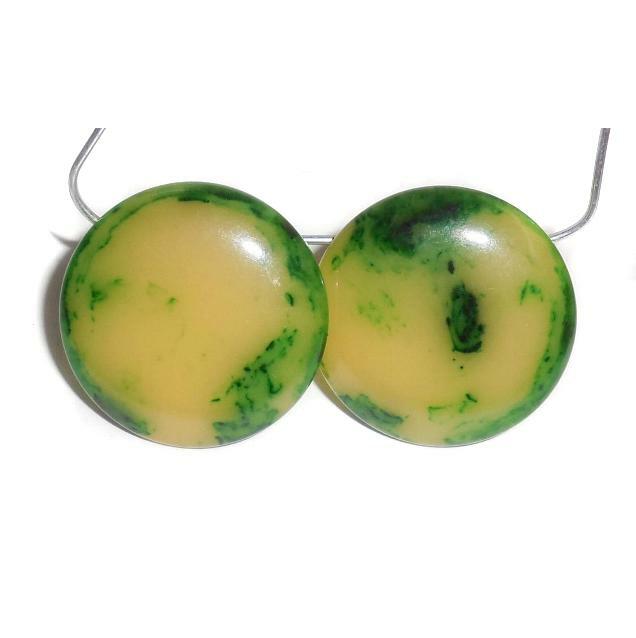 This is a pair of vintage simichrome tested and Guaranteed to be old strongly marbled bakelite clip on earrings in bright and deep pea greens to winter squash colors. They are large disc button shape and have small curvature so they sit pretty flat to the ear. Size is 28mm or 1 1/8" across. Large and noticeable. They have gold plated clip on backs that are strong and secure. No wear to the gold plating at all. These were only ever used for display. You can still hear the loud snap when clip are opened and then closed in place. No wear to the polished finish either. In great condition this is a lovely pair of vintage showy bakelite clip earrings for your collection or display. In beautiful condition this is a lovely vintage mid century gold plated Castlecliff love knot pin with a large black faceted glass stone and rhinestones. The stones are bright, clean, clear and crisp. No wear to the gold on the front or back. Looks like it was rarely used. Size is 1 1/4" tall North to South by 1 5/8" wide across East to West. The clasp is also excellent. 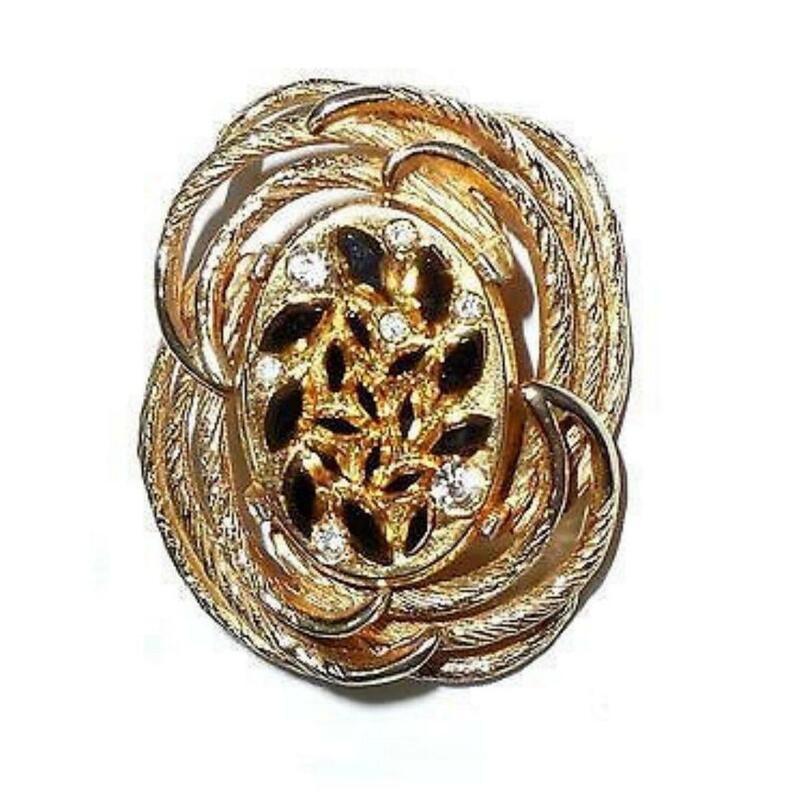 Having ***no gold wear this is a lovely vintage designer statement pin for your jewelry collection. Never Used Mint Condition from an old jeweler estate this is a pair of vintage late 1960s to 1970s mid century rosewood crescent hoop earrings. They are pierced post with butterfly closures. Late 1960s and 1970s mid century Scandinavian, European, and American designs incorporated various exotic and/or high quality wood into their jewelry, kitchen, tableware, flatware/cutlery, furniture and various other products. 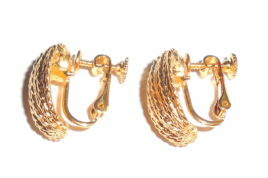 Thick wide crescent earrings were also very popular during this era having been made from many different types of materials. You can tell these are older from the 1/8" depth, graduated width going around, the chunkiness and the workmanship. Beautifully cut and finished with a soft luster. These look and actually feel soft in the hand. Size is 1.5" wide across the center end to end east to west. Size measurement north to south from top of open space down to the bottom center of the crescent is 1.43 inches. The widest point of the crescent at the bottom center is 1/2" across. In perfect, well matched, beautiful condition this is a lovely example of mid century wood jewelry for your collection. Vintage Mid Century Enameled D Pin Donna Dorothy Debbie Debra Diane from an estate and has some minor age wear on the back and a small spot of wear on the front that has not been cleaned out. Otherwise it is excellent. 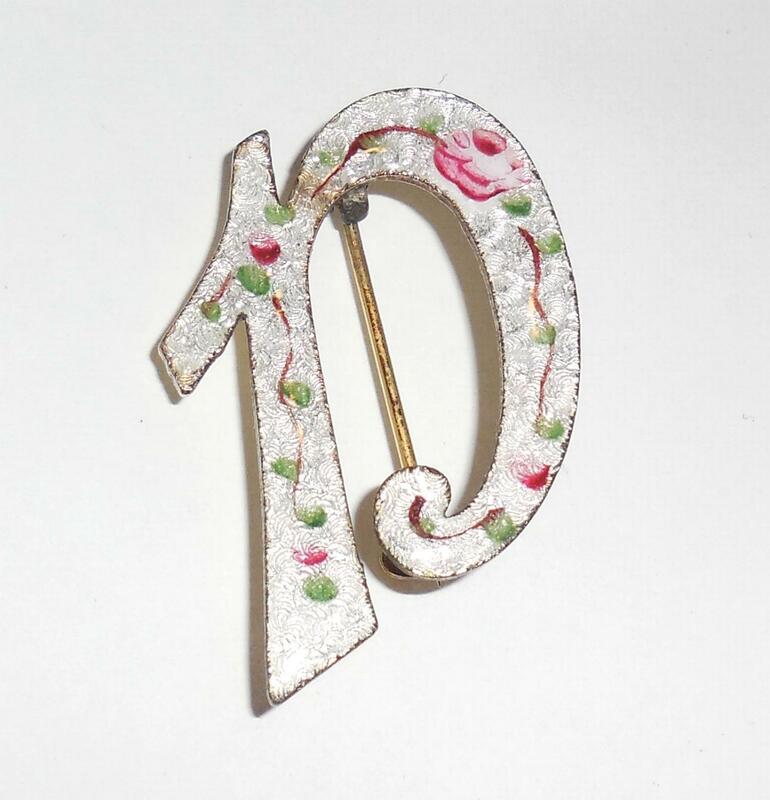 Beautiful, soft, pretty, vintage enamel work on this one. Please see photos and read product description for measurements and further information. This a vintage slate mid century 1960s-70s signed Florenza black on white cameo pin in excellent condition. Sorry for photo glare. It is old store stock and was only ever used for display purposes. 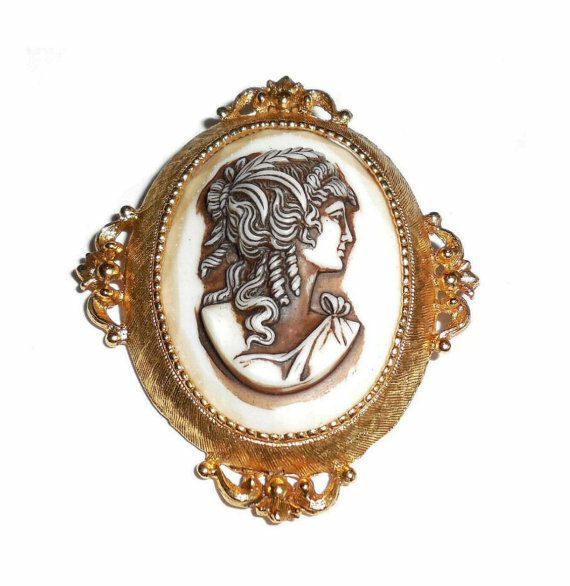 The cameo is resin with faceted edges that go all the way around the bezel. The face is beautiful and finely detailed. the frame is heavy gold plated and very well made. It is still clean, crisp and clear. The heavy gold plating is perfect....absolutely no wear to the gold. No abrasions to the cameo. Size is 2 1/4" tall by 1 7/8" wide. This is a lovely example of vintage Florenza for your collection. Great condition! 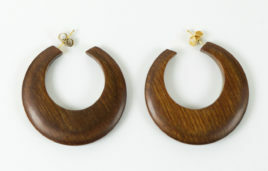 Vintage Mid Century Olive Wood Huggie Hoop Earrings Pierced Post - made of genuine vintage exotic wood, olive wood this is a lovely pair of old jeweler estate huggie hoop earrings. Late 1960s to mid 1970s. Old store sample in good as new condition. Silver plated posts with butterfly backs. Height is 1" north to south without the post. Width across east to west is also 1" across. These are very thick, chunky, vintage mid century earrings that graduate from 1/4" at the top to 3/8" across the bottom centers. Thickness is a full 3/16" all the way around. 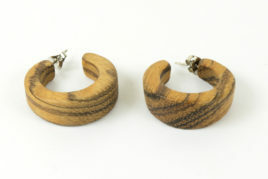 Both earrings have good strong deep graining in the wood. You can actually still smell the natural wood. 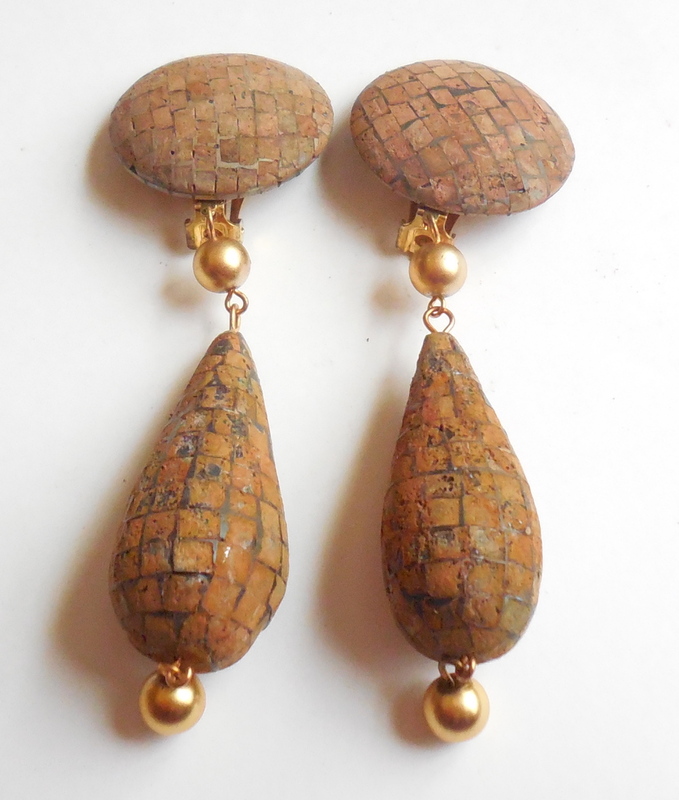 This is a lovely pair of mid century exotic wood earrings for your collection especially is you like hippie and Boho looks. 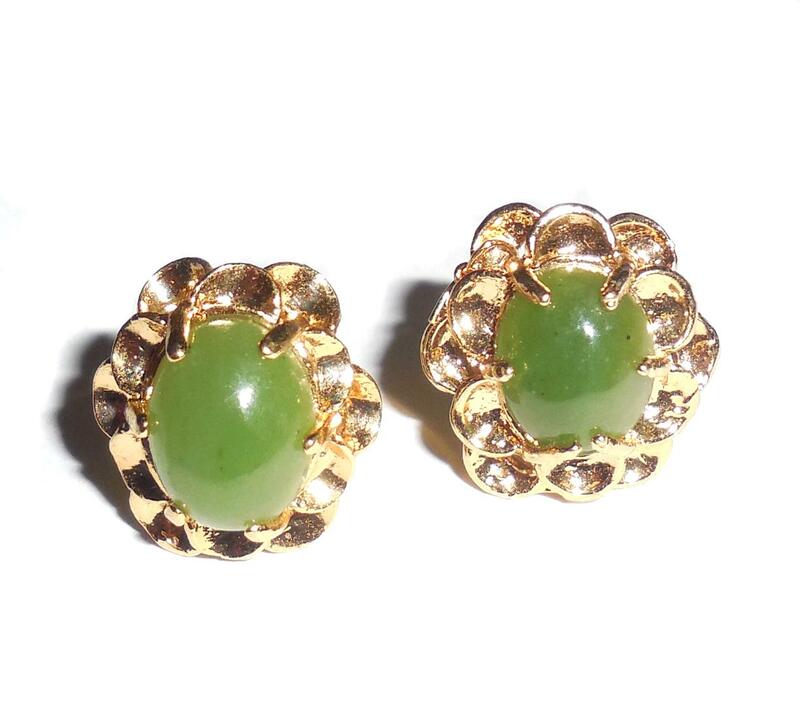 Made in the 1960s-70s back when it was unusual for manufacturers to use natural gemstones in gold plated settings this is a lovely pair of vintage natural green jade cabochon earrings with pierced post backs. They are heavy gold plated. The jade stones are medium to apple to deep green color. They are 10mm long. Being natural one is a little lighter color than the other. Size of each earring is 5/8" North to South by 9/16" wide East to West. One of the backs has a curve to the supports and the other is flat. This does not detract or compromise the earrings in any way. Both are in excellent condition. Absolutely no wear to the gold or the stones. They are very well made with long posts and extra supports in the back to hold the stones.